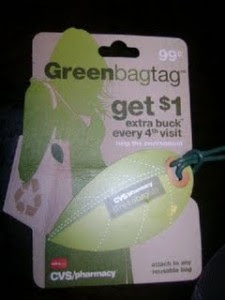 Centsible Savings: $1.00 ECB's just for using Green bags! Wow, here's a great way to earn some extra ECB's! I have thought about bringing in my reusable bags that I have been getting from free at Publix and using them at CVS, and now I know I will! The next time you go to CVS look for the Green Bag Tag in the picture above. Buy it for $0.99. Attach the tag to any reusable shopping bag and have the cashier scan each each trip at CVS. You will earn $1.00 in ECBs every 4th time that you use your reusable shopping tote and get the Green Bag Tag scanned.